why it's only 800 MHz lol..
for dos wanting to buy dont hesitate nemore niy sony neo v , I hv researchd extensivly among all mobile stores, advisors n users n u wont find a fon havng al specs at even high range of 19-20. one imp thing to b noted, u will fond very less complaints n problems comparing other fones. when I was buying it , a couple was also buying samsumg fon and he cudnt even resist glancing neo v n cmparing it to his as its look is like watvhing a full moon frm a river' reflection, its stunning n coming to psrfrmnc it has decent speed, u cn even voic chat clearly on 2g forgt 3g. al in al best buy in range of 20k but at a lesser price. why samsung release this phone with price about 340 euro. I better choose xperia sola which more cheap..
Xprit, 18 May 2012http://www.amazon.de/gp/product/B007UOXRS6/ref=noref?ie=UTF8&psc=1&s=ce-de and ... moreUk - This item is due to be released on June 1, 2012. 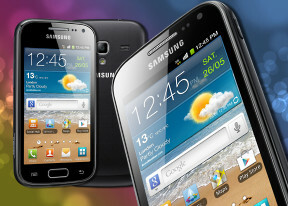 They might launch it along with galaxy s3,which will be launched on the first week of June. ya @Ravi chris said it ryt. Galaxy wonder isnt releasd in india and samsung wont upgrade to 4.0. i'm buying sony neo v (experia u doesnt have card slot lol who doesnt want slot) all specs nearly same as ace 2 plus ICS plus better luks. Xperia U There is no Card Slot its only have 4gb internal....what use an android phone with only 4 gb storage???? AnonD-39640, 16 May 2012Hi guys can any1 pls tell does this phone has gorilla glass or not ...... pls tell me guys.. ... moreNo it doesnt hv . Hey any idea when this is gonna release in india?? And when ull say Q2 its financial year quarter right or calendar year? Hi guys can any1 pls tell does this phone has gorilla glass or not ...... pls tell me guys..